With a pre-med educational background and professional experience that includes oncology, emergency medicine, and physical therapy, Kyle Parker brings a comprehensive understanding of the human body to his fitness career. 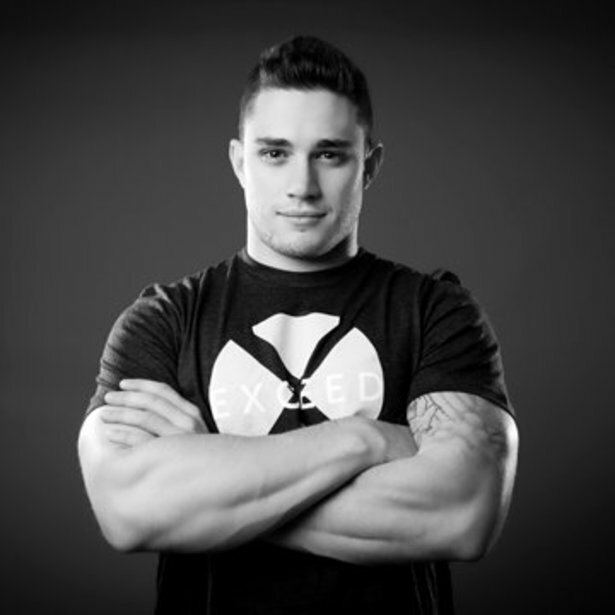 Kyle is a Trainer and Director of Business Development at Exceed Physical Culture, a boutique, revolutionary functional fitness gym that encourages every member of their community to be an athlete and achieve their highest fitness goals. Here, Kyle chats about what inspires his fitness pursuit, offers some advice, and owns up to his favorite cheat meal! What inspired you to pursue a career in fitness? Originally I had moved from Virginia to New York City to pursue a career in medicine. In efforts to build a well-rounded resume, I had done research with Memorial Sloan-Kettering Cancer Center and worked in emergency medicine for some clinical experience. As a college student I always knew that I was fascinated by the human body and the physics of human performance, so any career that allowed me to study the body was right up my alley. After spending a little over a year in New York City, I had fallen in love with the fitness scene and was a very active member of several communities, such as power lifting, CrossFit, and athletics. That influenced my next decision to work in physical therapy, which I thought at the time would bring my passions for health and performance together. In October 2014, an opportunity fell into my lap to teach classes with Exceed Physical Culture and I was quick to learn the brand and loved being surrounded by very driven, high-level athletes on their staff. I had found a community and a family that I loved. Thanks to them, my first steps into Exceed every morning are a continuing source of inspiration. I'm naturally very competitive and working in this atmosphere is contagious. My team gives me the motivation to chase my own professional goals and performance goals. Since becoming a group fitness instructor, I've built my own personal training business and taken on a role as Director of Business Development with Exceed Physical Culture. Being given an opportunity to not only be part of the community but take on a leadership position has helped me grow in so many ways. If you could give one piece of fitness advice, what would it be? The next fad isn't the answer. There is no blueprint to success. Choosing to pursue an active lifestyle should be a fun and rewarding experience. If you're not having fun, you just haven't found what's right for you yet, keep searching! It's also really tough to have fun working out alone - so find a friend with similar goals to go through your journey with you. Keep each other accountable. Also a bit of friendly competition never hurt anyone! What is one fitness move everyone should master? Learn a really, really good squat. Practice it everyday. Period. What is your fitness philosophy and teaching style? I believe that when someone makes the conscious choice to purse a healthier lifestyle and think of themselves as an athlete with performance goals, the structure and discipline required to progress ends up positively influencing every area of the person's life - career, relationships, social life, and obviously every aspect of health imaginable (physical, mental, spiritual, etc.). My teaching style is to not only lead by example and chase high-level performance goals myself, but to give my clients the tools they need to eventually train safely and at high intensity without my instruction. I'm confident that all of my veteran clients could pursue careers in personal training themselves just from our experience together. Eventually my clients have a great understanding of the mobility and technique needed to practice all functional movement patterns and structure their sleep and nutrition in a way that helps them reach all of their goals - not only in the gym, but also in their careers and relationships. What is your go-to workout song? I always mix up my choices but I always have a solid serving of protein and carbohydrate. A turkey burger (no bun) and baked sweet potato is one of my favorites! Be honest: What is your cheat meal or guilty pleasure food? Any trainer or high-level athlete that tells you he/she doesn't cheat is more than likely a liar - we all cheat! It's good for your metabolism from time to time and it's good for the soul. Grasshopper Pie (mint chocolate chip ice cream) on a monstrous waffle cone from Emack & Bolio's is my go-to. Earlier this year one of my veteran clients participated in his first sprint triathlon finishing 8th out of 33 in his age group and 55th out of 386 overall. He attributed his success in his first race to his workouts at Exceed, telling me, "Like I said, that was my first Tri event. I don't even own a road bike. I had to rent one. The Exceed education is the Harvard of boot camps. You are prepared to go anywhere and do anything." As a trainer and instructor, seeing your clients do things with their bodies they never thought was possible is one of the most rewarding aspects of the job. …watching my favorite television shows - I'm obsessed with The Night Of on HBO right now! What makes Exceed so effective? 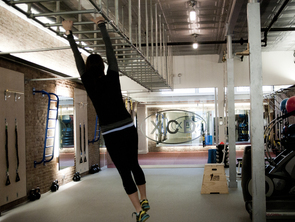 Our instructors and trainers are the best New York City has to offer, hands down. A lot of the group fitness in the marketplace today is heavily focused on the social atmosphere - a "rah rah" type of class. At Exceed, performance and results are our priority and recruiting experienced and knowledgeable instructors along with our class format does the job itself. Our fast and intense pace gives the body quite the training experience - strength, cardio, fat-burning and actually LEARNING high-level functional movements is what every athlete is looking for. At the end of the day that's who comes to Exceed and stays with us forever: ATHLETES. Feeling inspired? Reserve a class with Kyle at Exceed's Upper East Side or Tribeca locations.